We see a bright dividend future in these tech, tool, and pipeline stocks. All too often, investors focus their attention on a stock's current yield, and if it doesn't catch their eye, they pass on by. This causes them to miss some of the best dividend opportunities of the future, which are those stocks that have the ability to consistently increase their payouts, which often leads to far more wealth creation over time. We've zeroed in on three of these dividend growth opportunities that we don't want you to miss this December. Matt DiLallo (Enbridge): Investors seeking dividend growth need to take a good look at Canadian energy infrastructure giant Enbridge (NYSE:ENB). For starters, the company already pays a pretty compelling dividend that currently yields 3.7%, which it supports with an investment grade balance sheet and the fact that fees supply 96% of its cash flow. On top of that, Enbridge intends to boost the payout by 15% next year as a result of closing its merger with natural gas pipeline company Spectra Energy (NYSE:SE). That increase, however, is only the beginning. Enbridge believes that the combination of its growth project backlog with Spectra Energy's will fuel 10% to 12% annual dividend growth through 2024. Further, it can achieve that robust rate while maintaining a conservative payout ratio between 50% to 60% of cash flow. Driving that growth in the near-term is the fact that the combined company has $20 billion of projects currently under development, which support dividend growth through 2019. In addition to that, they have another $37 billion of investment opportunities such as offshore wind farms and new pipelines to propel growth over the first half of the next decade. Enbridge offers investors unmatched visible dividend growth in the years ahead, which is why those seeking income growth should seriously consider adding the stock to their portfolio. Neha Chamaria (Illinois Tool Works): Buying a stock that pays a dividend is one thing, but buying a stock that has consistently grown its earnings and dividend for years is another thing. When you buy the latter, you're investing in one of the top dividend stocks out there. 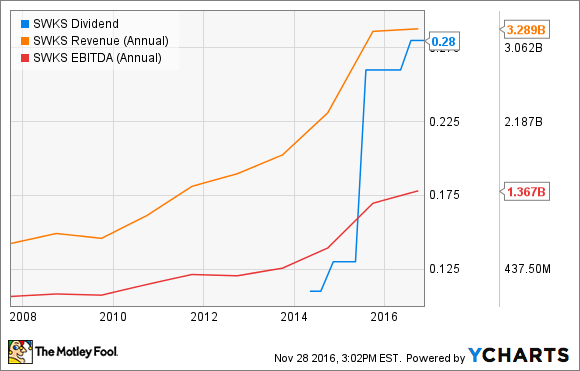 Industrial conglomerate Illinois Tool Works (NYSE:ITW) is one such dividend growth stock you can buy now. Take a look at the following chart that shows how Illinois Tool Works' earnings, free cash flows, and dividends per share have grown in the past five years. ITW Normalized Diluted EPS (TTM) data by YCharts. In fact, that upward trend goes back several decades, which is why Illinois Tool Works has been able to increase its dividends every year for 53 consecutive years, regardless of the business cycle. Its dividend has grown at an average compounded rate of 13% since 2011. I don't see any reason why Illinois Tool Works shouldn't be able to raise its dividends for years to come. In the near term, the company projects its EPS for the full year to grow 9% at mid-point. Beyond 2017, Illinois Tool Works is targeting 10%-12% growth in EPS. Analysts estimate its earnings to grow 8% in the next five years. The company shouldn't have a problem doling out higher dividends from those incremental earnings as it's currently paying out only about 40% of its profits in dividends. 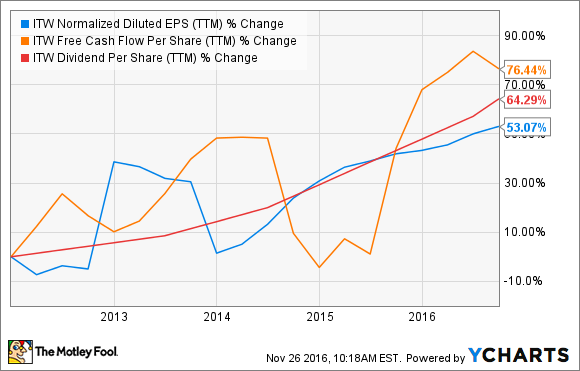 Long story short, Illinois Tool Works has everything that makes for a solid dividend growth stock. Daniel Miller (Skyworks Solutions): An innovator of high performance analog semiconductors that help connect people, places and things, and a major supplier to the two biggest smartphone players, Skyworks Solutions (NASDAQ:SWKS) has been a tremendous growth story over the past few years and its dividend might take a similar upward trajectory over the next decade. SWKS Dividend data by YCharts. Despite recently beating expectations in its fourth-quarter fiscal 2016, its shares trade for a meager 14 times earnings. The reason behind that is evident on the graph below as its revenue growth has slowed over the past year, causing concern on Wall Street. But don't be fooled, there are plenty of ways for the company to expand in many channels -- automotive, broadband, cellular infrastructure, connected home, industrial, medical, military, in addition to increasing content in its smartphone, tablet and wearable business -- and management believes revenue growth will start climbing again come March of next year. Basically, Skyworks is a bet that the world will increasingly connect devices to one another, otherwise known as the Internet of Things. But that growth story will take place over the next decade, and currently the company's revenue growth is tied to the maturing smartphone market. Even in its bread-and-butter smartphone market, as the rest of the world trends toward more complex 3G and 4G phones and networks, it should easily fuel Skyworks' top and bottom line, and that should set the stage for a consistently growing dividend with upside as the Internet of Things gains momentum.